Did you earn any $6 Bonus Coupons during the month of July? 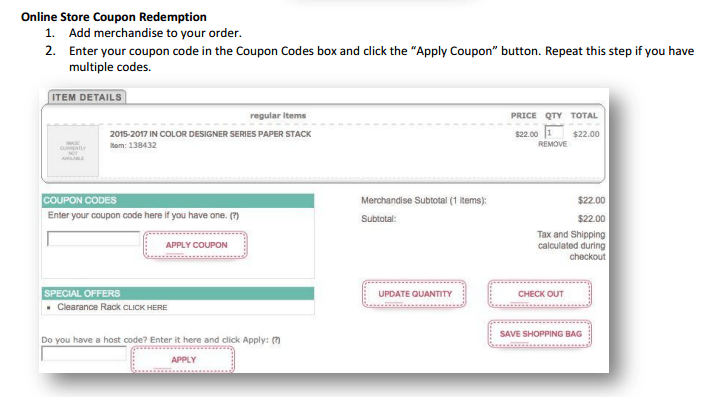 Redeeming your Coupon Codes is easy. If you’d like me to place your order for you, simply include your Coupon Code with your order, and I’ll add it when I’m entering your order. If you have more than 1 Coupon Code, you can simply enter the next one after you’ve clicked on the ‘Apply Coupon’ button for the first code. You can repeat this step for as many Codes as you want to redeem for that order. You don’t have to redeem all your Coupon Codes in one order; if you want to spread them out throughout the month, just apply the ones you want, and save the rest for your next order. So go ahead – Shop! – and Save! Just click my name below to go to my online store, or click the Catalogue button on the side bar to start browsing. Until next time – happy shopping & stamping!